Buy Sunita Organic Pure Lime Juice - 250ml in the UK from our online shop or directly from our independent Scottish store. Sunita’s organic lime juice is squeezed from fresh organic limes grown in the warmer climes of south Mexico and Brazil. Organic lime juice (squeezed from fresh organically grown Mexican & Brazilian limes). This Pad Thai recipe is absolutely delicious. This recipe contains Juice of 1 ½ Limes. We sell real Sunita and other Juices & Soft Drinks directly from our shop in Scotland and online throughout the UK. Where can you buy real Lime Juice - Organic safely online? 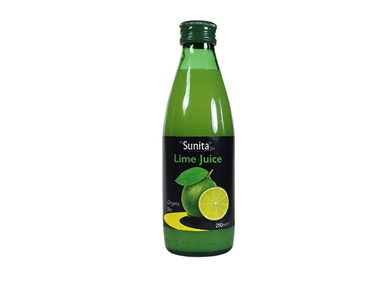 If you are wondering where you can buy Sunita Organic Pure Lime Juice - 250ml safely online in the UK, then shop with us. Lime Juice - Organic - Sunita Organic Pure Lime Juice - 250ml in Juices & Soft Drinks and Drinks.